If we tell you that Crello is just another photo editing software which also allows you to design graphics, we would be correct, but that would be only half true. The complete fact is that Crello is a free graphic design and photo editing software which helps to carry out such tasks even if you lack the necessary skills in editing and designing. It provides you with a lot of templates, per-formatted designs which you can customize as per your needs and requirements. Therefore, Crello is an editing tool which must be used for easiness and quality. 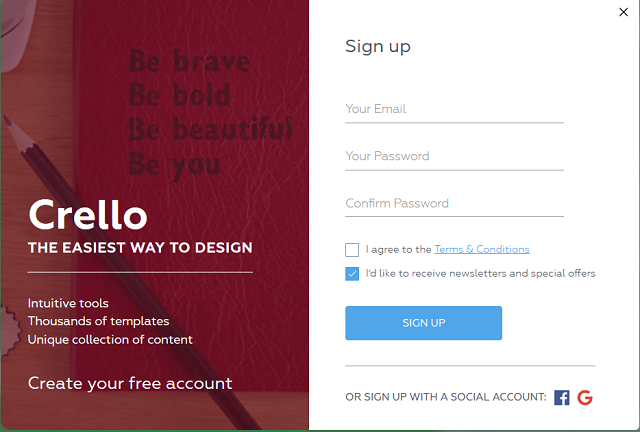 Why Should You Use Crello? This is a significant question which everyone has in his mind while reading the reviews of the websites. So here is the answer to the above question. Let's assume that you want to hire a graphic designer for your newly set up business, but as you know, graphic designers charge a hefty amount for their services and not everyone can afford them, at least not in the initial days unless he has a considerable investment. Therefore, you can use the tools such as Crello which become a graphic designer helper for you and you can take over the semifinals work done by the online tool. This way you can save a lot of money, so you should choose a tool like Crello. Using Crello, the online photo editing and a graphic designing tool are very easy. You need to create an account on the website using your current email and set up a password for security. After that, you can easily upload your pictures from your devices to format them and also edit them using the various tools offered by Crello. Also, you get most of the features for free except for some of the Pro features which can be accessed after paying a small amount. 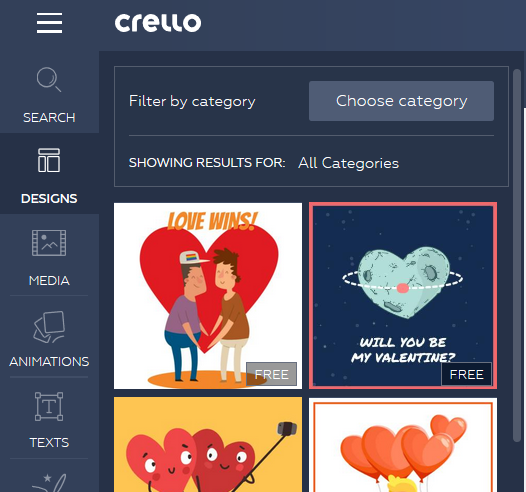 Apart from that, all the users of Crello are entitled to obtain unlimited online storage on the servers of Crello where their images, templates, etc. are safely stored. So, they don't need to keep a backup of their data and cover up an ample space on hard drives. Crello has a vast collection of photos which can be used at any point in time while you are designing your templates or posters or anything else related to photography. When I say huge, I mean huge. If we estimate the exact amount of photos that Crello offers to choose from, the number will come somewhere around 60 million photos. This is a considerable number, and indeed, you won't be needing this much of photos to choose from, or you'll spend your life picking only photos. Just search for the type of the picture you want for your purpose and then you can choose out of the ones that are displayed in the search results. 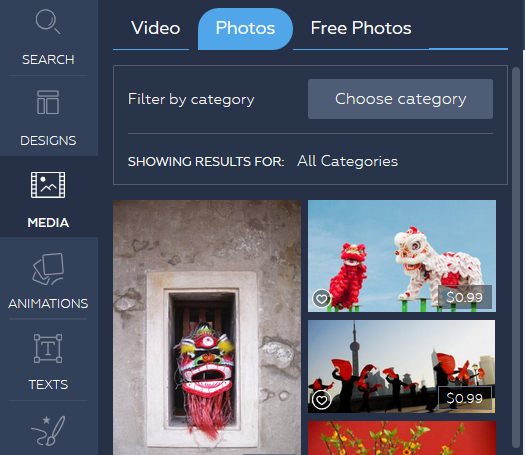 It hardly takes a minute for the search tool to fetch you a lot of photos for you. If you want to use the tool for graphic design, then it would be a tiring task if you don't have the relevant skills to design it right from scratch. There's when you find yourself in dire need of a tool like Crello. Crello offers you a total of 10000 pre-designed templates which can be either used as they are or you can use them to suit your needs and the requirements. You only need to decide what type of design you want, and Crello will take care of most of the things thereon. Graphic designing was never this easy. As an online tool, Crello has a highly friendly user interface. Once you open the website, you are greeted with a mesmerizing look of the website which looks cool. The edits and designing process proceeds with a simple click-based activity or a click and drag based technique. Additionally, you only need to set an output dimension of the image or template and forget about that. The output will be as per your requirements. Crello also allows you to export and share the output file in a large number of formats and also across a large number of websites such as Facebook, Twitter, etc. Crello has a wide range of applications so it can be used by people from every field of work, be it a businessman or a student. It is now widely used by a lot of people and is accessible on almost all devices, from desktop to laptop and smartphones. However, due to some reasons, the smartphone users face some issues which are likely to be fixed in the time to come. This was a thorough review of Crello, the free graphic design and photo editor tool which indeed one of the best tools available in the market. It makes your life a lot easier and saves you tons of time so that you can invest it somewhere else. It is a must try the tool for every photo editor and graphic designer.